After their triumph in the SCFL Division 2 Cup final, which they won for the third time in four years, Bosham had two league games left. Bosham maintained their late-season push for a top-three finish and came away with all three points with the youngsters on display putting in a great shift at Cowfold. Harry Spicer made his first-team debut with young Harley Redman in goal as the management rang the changes with the titleout of reach, and Bosham started well. 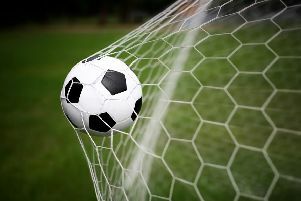 Sidlesham held on to secure the win that saw them finish second and Bosham had to settle for a fifth-place finish and will look to come back stronger for the new campaign when it gets underway in August. The Blues had the first real chance after ten minutes when Greg Brabon headed goalwards from a Harry Williams corner. Spicer was on the line to clear the danger. Brabon had another pop, this time from long distance, which drew an excellent save from Redman. On the 20-minute mark Bosham took the lead through the dangerous Grant Radmore, who cut in from the left and unleashed a left-foot shot that left keeper Rhyse Nash rooted to the spot. Max Smith, Callum Coker and Radmore were a threat but a moment’s lapse of concentration at the back allowed Sam Whyton to nip in a poke the ball over the line to draw the hosts level. Bosham should have been back in front as a swift move caused panic in the box but, somehow, they couldn’t find the net. Right on half-time another fine move did unlock the door as Smith darted into the box and laid the ball square to Matt Docherty, who teed up Jack Hardman and he rifled a shot into the bottom corner. In the second half Bosham looked more settled on the ball. Coker should have added to the tally when he was found by a lovely ball over the top but his touch let him down and the Blues cleared. Smith found a clear route towards goal but Nash did just enough to deny him and keep Cowfold in the game. Late on another debutant Deon Newby came on for the Reds and he finally finished the contest with a third goal for the visitors. A pass back to Nash was attempted but the keeper produced a huge air-kick, allowing Newby to prod the ball into the empty net. Spicer was deservedly named man of the match. Bosham: Redman, Spicer, A Smith, Docherty, James, Edgington, Jepson, Hardman, Coker, M Smith, Radmore. Subs: Newby, Lidster, D Smith. Bosham’s lengthy season came to an end on Bank Holiday Monday with a derby loss to near neighbours Sidlesham. A win for the visitors secured runners-up spot in the league and in front of a bumper crowd of over more than 200 on a sweltering day, the visitors had the better start with Jake Goulding forcing a good save from keeper Harley Redman. Sidlesham upped the tempo and deservedly took the lead just after the quarter-hour. Bosham failed to deal with a corner and the ball arrived at the feet of Goulding, who controlled it smartly and slammed in a volley which flew into the bottom corner. Bosham were struggling to create much and Sidlesham keeper Connor Kelly was largely untroubled. On the half hour Bosham went two behind when Tom Atkinson doubled Sids’ lead. The midfielder struck a shot from long distance that found the net through a combination of bar and keeper. In the second half Bosham were forced into a change when playmaker Jack Hardman had to go off with a shoulder injury, allowing James Wilson to come on to bolster the midfield. But Sidlesham added to their tally when Harry Gregory netted their third. The Reds’ defence was cut open and Dan Bassil fired in a low cross that Gregory thumped ins. Bosham still attacked and on the hour Max Smith got his head to a free-kick from Grant Radmore, flicking the ball to the back post where Matt Docherty was lurking to prod the ball over the line. Late in the game Wilson had a great chance to get another goal back but scuffed his effort wide. Bosham: Redman, Bulbeck, A Smith, Bell, James, Docherty, Edgington, Hardman, Coker, M Smith, Radmore. Subs: Spicer, Lidster, Wilson.